In "Yen," Fırat Neziroğlu interpreted the sirwal with slim fit patterns. Renowned Turkish fashion designer Hakan Akkaya colored New York Fashion Week with two fashion shows entitled "Glam Rock" and "Turkish Designers" this week. The first show was introduced at Springs Studio on Feb. 10, while the second was presented yesterday and showcased four Turkish designers. As part of the "Turkish Designers" show, the collections of four Turkish designers, Buket Özkalfalar Barut, Gökhan İldeniz, Ece Kavran and Fırat Neziroğlu, were exhibited. 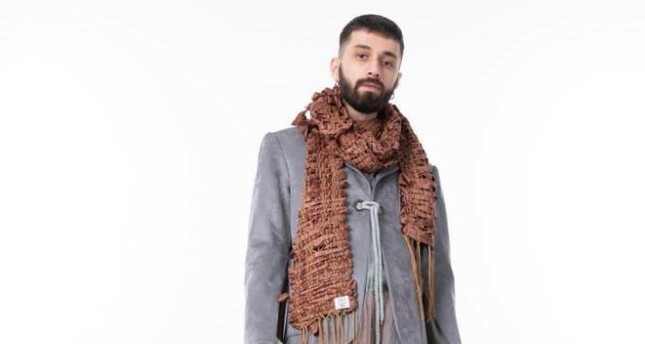 Among these designers, contemporary weaving artist Fırat Neziroğlu prepared a men's collection called "Yen," which was inspired by the Anatolian region. The collection met with fashion enthusiasts as part of New York Fashion Week and reflected Anatolian styles with a contemporary twist. The artist, who has exhibited in many international shows so far, created a contemporary interpretation of the many details used in Anatolian culture with this collection. Neziroğlu, an important representative of contemporary weaving art in the world today, has designed many textiles using the Anatolian rug model. Speaking to Anadolu Agency (AA), Neziroğlu said the men's collection "Yen" was specifically designed for New York Fashion Week. He said his interest in weaving began at an early age in primary school and that he learned to weave with the support of his grandfather who helped him buy a loom. Later Neziroğlu began studying fashion in university, but switched to the weaving department, which has remained his main area of interest. Despite opposition by his teachers, he developed new techniques in weaving and created numerous unique works. Neziroğlu said that weaving workshops have been established in Canada under his name, adding that some academics in Spain have also tried this technique. "The most advanced thing in textiles is abstract art. We bring the threads side by side and create patterns and waves. This is a kind of expression. The works I have woven so far have been exhibited in many countries, including the United States, the United Kingdom, Mexico, Spain, the United Arab Emirates, Korea, Argentina, Germany and Lithuania," he said. Neziroğlu further noted that portraits have an important place in his work, indicating that he most recently weaved the portrait of Queen Elizabeth II. He continuously worked on the portrait for six hours a day for two months and wants to present the portrait to the queen somehow. Neziroğlu said he had stayed away from fashion for many years and was happy to have presented his show at New York Fashion Week. He stated that his participation in New York Fashion Week was finalized a few weeks ago, adding: "In two weeks, I created a men's collection named 'Yen.' I am practicing the Anatolian rug technique, but my work is contemporary. In fact, it seems to include no sign of Anatolia. There is neither a rug motif nor an Anatolian color, but there is that feeling in essence and at heart, just like the hospitality of Anatolia. "I think the main purpose of the design is not aesthetics but function. The aesthetics comes later. In the pants I interpreted the sirwal, which are a style of pants, with a pattern according to slim fit patterns. This collection is inspired by Anatolia and speaks about Anatolia, but I never broach the subject of Anatolia ... The collection does not shout that it is Anatolian but shows Anatolia in essence and feeling." Neziroğlu said that he is very excited that his collection will be in the spotlight, saying that he has been working on converting the collection into ready-to-wear clothing.